Malaysia Property News | Property Market In Malaysia: Dijaya MD to take optional retirement? Dijaya MD to take optional retirement? 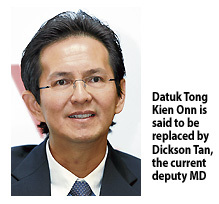 PETALING JAYA: Dijaya Corp Bhd managing director (MD) Datuk Tong Kien Onn has decided to take optional retirement after more than 25 years with the property development company. Business Times understands that Tong, 53, will be replaced by Dickson Tan Yong Loong, 31, who is currently the deputy managing director. Tan is the son of Dijaya founder and major shareholder, Tan Sri Danny Tan Chee Sing, who is the younger brother of the high-profile Tan Sri Vincent Tan, founder of Berjaya group. It is unclear when Tong would be leaving the company. He was not available for comment. Tong and his team, under Danny Tan's leadership, have helped build Dijaya to its current size. Dijaya gained fame for turning a 260 hectares of secondary jungle in Tropicana into a luxurious gated community, known as Tropicana Golf & Country Resort, where the property value has increased by 10-fold. The company's market capitalisation is about RM1 billion and Danny Tan is aiming to triple that with a slew of property projects lined up for launching. "It is the close working relationship that both Tong and Danny Tan have since 1983 that has made Dijaya successful. "Danny Tan has been instrumental in building Dijaya and giving Tong and his management team the opportunity to help achieve his vision for the company," said a source close to the parties concerned. Tong joined Dijaya in 1991 as senior finance manager, primarily responsible for the group's finance, accounting and treasury functions. He was then promoted as general manager of finance and administration in 2000 and to a more senior position in the same year, before being appointed as the executive director in 2002. Tong was appointed to the board of Dijaya on January 18 2002 and managing director on May 10 2007. He currently sits on the board of Tropicana Golf & Country Resort Bhd, Berjaya Corp Bhd and several other private limited companies. Dickson Tan, meanwhile, was named to the board of Dijaya on May 20 2009 and made the company's executive director on April 1 2010. He was designated as deputy MD of Dijaya on October 8 2010 and is currently overseeing group corporate strategy, planning and risk management of the company.